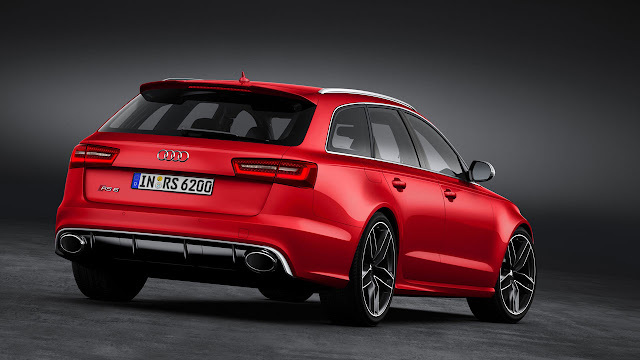 The all-new Audi RS 6 Avant will need just 3.9 seconds to dispel any doubt that its ultra-efficient new downsized V8 TFSI engine has compromised on muscle for the sake of miles-per-gallon. The latest super Avant will firmly cement its RS credentials by outrunning its mighty V10-powered predecessor with an exceptional sub-four-second 0-62mph sprint time. At the same time its smaller displacement and cylinder-on-demand technology will make 28.8mpg economy potential a reality. 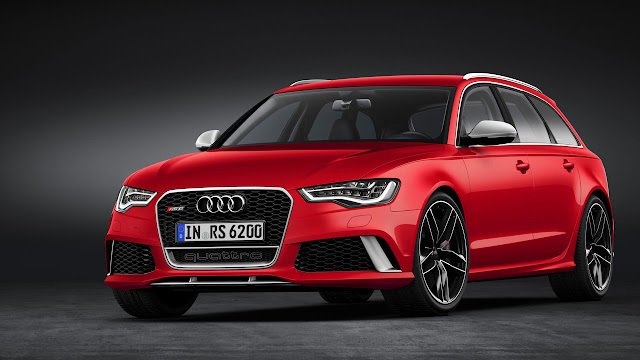 Available to order early in 2013 priced at approximately £77,000 OTR, and due in the UK next summer, the new RS 6 Avant will derive its phenomenal pace from a twin-turbo 4.0-litre V8 TFSI engine which replaces its predecessor’s 5.0-litre twin-turbo V10 TFSI. Peak output of 560PS in the new engine is reached between 5,700 and 6,700 rpm, with a constant 700 Nm of torque available between 1,750 and 5,500 rpm. 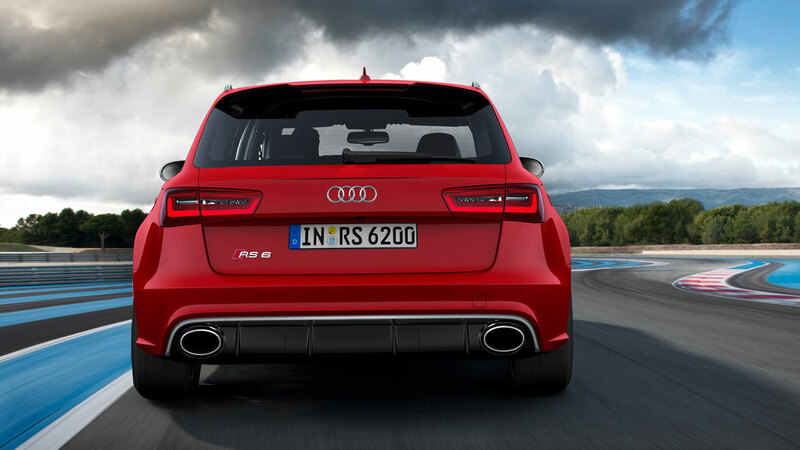 The two large twin-scroll turbochargers enable the RS 6 Avant to gather momentum with remarkable intensity. They are mounted together with the intercooler in the inside V of the cylinder banks. The exhaust side of the cylinder heads is also on the inside, while the intake side is on the outside. This concept allows for a compact design and short gas paths with minimal flow losses. The RS-specific engine management and unthrottled intake system also contribute to the eight-cylinder engine’s dramatic response, which is delivered to the tune of a classic V8 soundtrack. Switchable flaps in the exhaust system will make the sound even fuller at the touch of a button, and a sports exhaust system will be available as an option to provide even greater amplification if required. After catapulting to 62mph from rest in a best-in-class 3.9 seconds, the RS 6 Avant in its standard form will be capable of continuing to an electronically limited 155mph top speed where conditions allow. It will be possible to increase this top speed to 174mph by specifying the optional Dynamic package, and to go a step further still with the Dynamic plus package, which curbs acceleration only when the new super Avant reaches 189mph. Despite straying even further into the realms of the supercar, the latest RS 6 Avant nevertheless manages to register a fuel economy improvement of approximately 40 per cent, thanks partly to an engine start-stop system and innovative thermal management technology, but primarily to the new engine’s cylinder on demand (COD) system. At low to intermediate loads and engine speeds, it shuts down the intake and exhaust valves of cylinders 2, 3, 5 and 8. 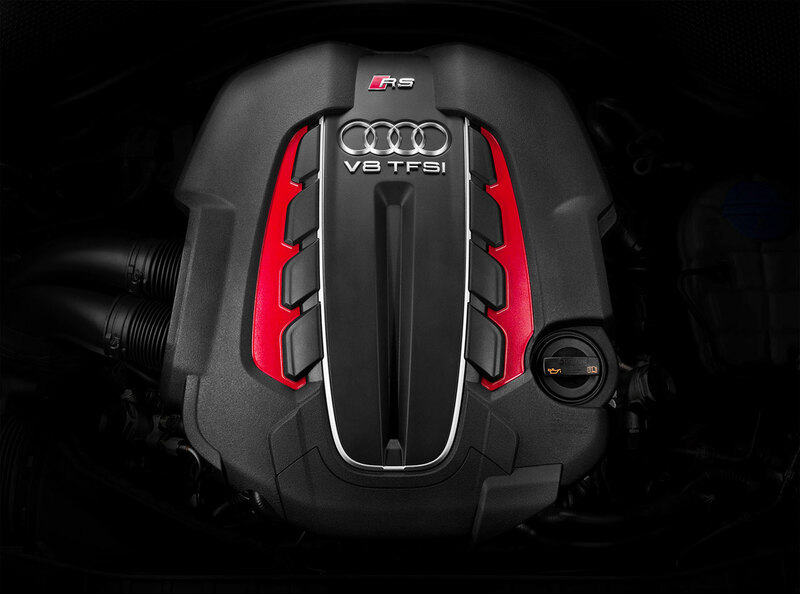 The 4.0-litre TFSI then runs as a four-cylinder engine until the driver accelerates more forcibly again. Efficiency in the active cylinders is increased because the operating points are displaced toward higher loads. The switch between four and eight-cylinder operation takes just a few hundredths of a second, and the only real indication to the driver that it is taking place is a visual signal within the instrument cluster. The COD technology reduces ECE fuel consumption by roughly five per cent. Even greater savings of approximately 10 per cent are possible when driving at moderate speeds. Active engine mounts use out-of-phase counter-oscillations to compensate for the vibrations that occur during four-cylinder operation. At the heart of the quattro permanent all-wheel drive system with torque vectoring is a self-locking centre differential with an elevated locking value. A sport differential is also active on the rear axle to distribute power steplessly between the rear wheels for even greater agility and stability. The new RS 6 Avant will be the first Audi RS model to feature adaptive air suspension. The specially tuned set-up lowers the body by 20 millimetres, and incorporates controlled damping which takes into account road conditions, driving style and the mode chosen in the standard Audi drive select adaptive dynamics system, with which the driver can influence the function of key components in multiple steps. As an alternative, sports suspension plus with Dynamic Ride Control (DRC) will also be available. This system employs steel springs and three-way adjustable shock absorbers that are interconnected diagonally by means of oil lines and a central valve for improved body roll stability. Dynamic steering will be another option which will allow the driver to steplessly vary the ratio and boost of the steering. This system can also be integrated into Audi drive select and, just like the standard electromechanical power steering, is tailored specifically for the RS 6 Avant. Not surprisingly, the brakes have also been engineered to take extreme performance in their stride. The four internally vented discs feature a weight-saving wave design with a wave-like outer contour. The front discs measure 390 millimetres in diameter and are gripped by six-piston calipers which are available in either black or red. Also available as an option are carbon fibre-ceramic brake discs measuring 420 millimetres in diameter. Their calipers are painted anthracite grey. High-gloss, 20-inch, forged wheels in a seven twin-spoke design will be standard for UK RS 6 models, and three 21-inch cast wheels with either high-gloss silver, polished black or polished titanium-look finish will be available at extra cost. The body plays a major role in the handling. It comprises roughly 20 per cent aluminium, and a sizeable proportion of components made from high-strength steel. 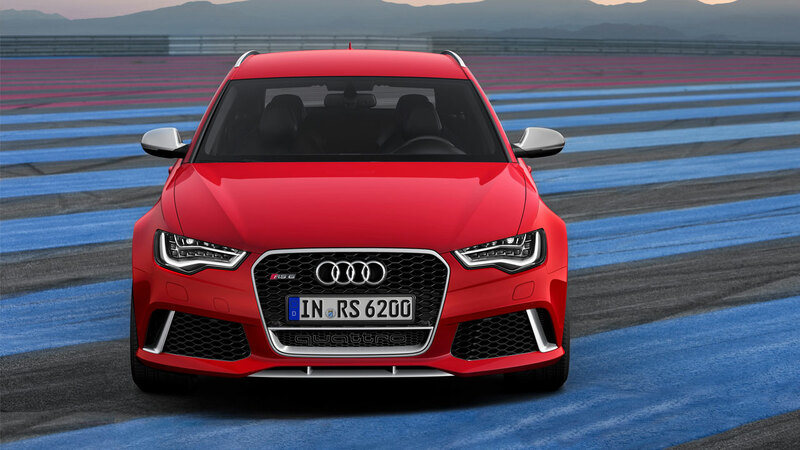 Through the more intensive use of lightweight materials Audi engineers have been able to reduce the weight of the new Audi RS 6 Avant by approximately 100 kilograms compared with its predecessor. This obviously has a positive effect on the power-to-weight ratio, which in turn enhances performance, efficiency and overall agility. Numerous RS-specific design details underscore the distinctive appearance of the high-performance Avant. Most noticeable are the matte aluminium applications on the body, the matte black honeycomb radiator grille at the front of the car, the bumpers, the wings, the sill flares and the large roof spoiler. At the rear of the car, the diffuser and the two large, elliptical exhaust tailpipes make a bold statement. Two optional exterior design packages – Matte Aluminium or Carbon – are also available to further customise the look. With the Carbon appearance package, the front splitter and the diffuser are even more boldly styled. The new Audi RS 6 Avant is available in eight exterior colours, including the exclusive shade Daytona Grey matte. Additional options from the Audi exclusive range offer numerous opportunities for customisation. The elegantly trimmed but highly focused cockpit of the new Audi RS 6 Avant is singularly tailored to the driver. The dial instruments feature black faces, white dials and red needles. The key, the flat-bottomed three-spoke multifunction steering wheel, the illuminated entry sills, the rev counter and the displays for the MMI and the Driver’s Information System (DIS) incorporate RS logos. The footrest, pedals and switches in the MMI navigation plus terminal have an aluminium look which contrasts with the piano finish for the decorative bezel surrounding the retractable monitor and the carbon inlays. A black headlining is standard, but Moon Silver or black Alcantara options are also available. RS sports seats with pronounced side bolsters, integrated head restraints and RS 6 logos will be standard. The seats are covered in high-grade, honeycomb-quilted Valcona leather in either black or Moon Silver. The seats can also be covered in an optional combination of black Alcantara and leather, and the centre sections feature diamond quilting. Power-adjustable comfort seats with memory function will also be available as an option. The luggage compartment holds up to 1,680 litres with the standard split rear seat folded. As befits the ultimate incarnation of the A6, the RS 6 Avant will feature a generous list of standard equipment, including xenon plus headlights, LED rear lights, a tyre-pressure monitoring system, illuminated entry sills and the RS-specific driver’s information system. Also on board will be the parking system plus with visual and acoustic prompts, cruise control, four-zone automatic air conditioning, MMI navigation plus with MMI touch, BOSE sound system, DAB radio and Audi Music Interface (AMI). Key options will include all-LED headlights with a unique design, ceramic brakes, sports suspension plus with Dynamic Ride Control (DRC), the Dynamic packages and practically every other high-end option available in the range. The list includes a head-up display and a portfolio of high-performance driver assistance systems, as well as the Bang & Olufsen Advanced Sound System with 15 speakers and 1,200 watts of total power. Mobile phone preparation – High, with Audi connect – the perfect complement to the MMI navigation plus – will also be available to deliver web-based services to the car.